President Muhammadu Buhari and Central Bank of Nigeria (CBN) Governor, Mr. Godwin Emefiele moved closer to actualizing their promise to strengthen the naira against the United States dollars by signing a landmark currency deal with the Industrial and Commercial Bank of China Ltd on Tuesday in Beijing, China. The agreement will allow Nigerian traders and businesses, which imports mainly from China conclude their transactions in the Chinese currency, the Renminbi (Yuan), instead of the dollar. 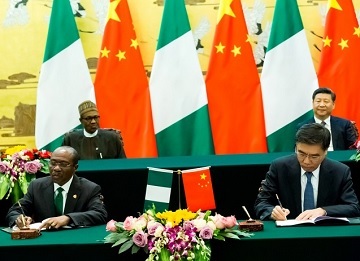 It was further gathered that the new agreement would see Nigeria-China trades, which accounts for over 70 percent of imports into Nigeria, concluded in the Yuan. Until now over 90 percent of international trades between Nigeria and the world is done in dollars, and in the process putting so much pressure on the naira. Nigeria imports almost all it needs from the West, Middle East and Asia. The CBN is expected to diversify a huge chunk of Nigeria’s foreign reserve from the dollars to the Yuan to perfect the agreement. “It means that the renminbi (Yuan) is free to flow among different banks in Nigeria, and the renminbi has been included in the foreign exchange reserves of Nigeria,” Lin Songtian, director general of the African affairs department of China’s foreign ministry, told reporters in Beijing a few minutes after the agreement was signed between the Governors of the nations’ reserve banks in the presence of President Buhari and President Xi Jingping of China, who is hosting Buhari and top Nigerian officials to a state visit. Lin said a framework on currency swaps has been agreed with Nigeria, making it easier to settle trade deals in Yuan. China has signed currency swap deals with countries ranging from Kazakhstan to Argentina as it promotes wider use of its Yuan. THEWILL exclusively gathered that Nigeria would become the clearinghouse for Yuan denominated transactions for the whole of Africa following the agreement. Beijing also signed agreements to develop infrastructure in Nigeria, part of a drive to deepen its ties with Africa. It has offered Nigeria a loan worth $6 billion to fund infrastructure projects. Also, ICBC signed a $2 billion loan deal with Dangote group, the company owned by Africa’s richest man, Aliko Dangote, to fund two cement plants it plans to build, Lin told Reuters. China’s official Xinhua news agency cited President Xi as telling Buhari that there was huge potential for economic cooperation, naming oil refining and mining. Nigeria is also considering issuing Panda bonds (mainly Yuan denominated) as against euro bonds because they are cheaper.